I’m planning on making some ramps in the next week or 2. Atm it’s basically going to be a pair of drive on jobs. Made mostly from 5-6mm mild steel folded into a 90 degree angle as I can get plenty of this at work to use. I’m also thinking of fitting a pair of bottle jacks in the ends so I can get more height when the cars backed or drove on. All fairly simple. What I would like to know as there seem to be a few guys on here that are very “switched on” is that if anybody has done this and has a nifty idea to lift the other axle? I’m very tight for space so a full length frame isn’t feesable for storage reasons. I’m open to all suggestions as I haven’t actually started it yet, very busy at work and can’t get a minute. Is my only real option to go with the trolley jack and stands? What I am thinking is a long shallow angle ramp to reverse the car onto in the garage and then lift the front and place stands all round to suit suspension work and the likes. Enough height is needed obviously for any other work requirements like brake pipes and possibly painting the floor back to new. As usual all ideas welcome. 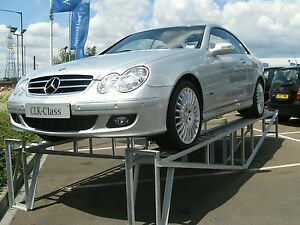 I can only get my car on ramps if I jack it up first, its too low to drive it up. I'm unsure about other peoples 996's in regard to this but I have seen these in your picture before and thought they were a good idea. I have also seen similar ones where you can remove the ramp part and give you more room to get under the car leaving the car just on the uprights. 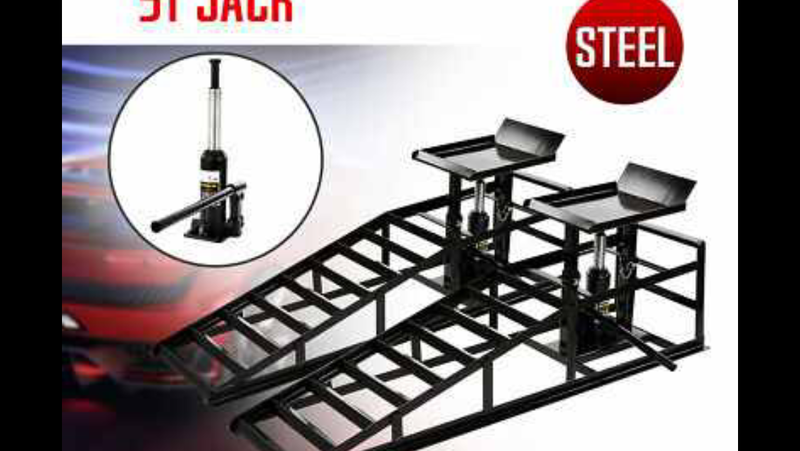 My ideal ramps would be a long slope to get to the top then the extra jack up part like you are thinking, would save me about an hour for jacking the front up. Hi, i modified my 2 standard ramps with bottle jacks i bought off ebay for 12 quid each, basically chopped the top flat part of the ramp out and welded in something very similar to what you have in the pic , they work a treat. I use these on the front then jack the rear up until my axle stands go under. 911 a way of life! Thanks guys. I’ve alrea been thinking that the bottle jacks aren’t really any good as the wheels will have to come off so I’ll end up in at that stage with the trolley jack and stands but at least there’ll be plenty of height. I had also thought about a removable section so that’s definitely a goer. My thinking is a couple of very small shallow ramps for the second axle and get the wheels up enough to get the jack in. Is there anywhere round the front section that would support the weight if I was to make an adaptater for the jack. I’m thinking spreads the weight but want to stay away from suspension etc for ease of working. I just reverse the car onto the ramps if i want to work on the front, i jack each side up a bit at a time it takes longer to do the front as i can't find anywhere to jack the whole thing in one go. |It still works well though. I’d say that’s what’s going to happen Hooner butid like some way of supporting the chassis further forward so u can clean and fix everything, including the jacking points. It may be a case of going everything inside the wheel arch and forwards then stick the wheels back on, drive up the ramps and jack the rear up do the floor section. I can only get my car on ramps if I jack it up first, its too low to drive it up. I'm unsure about other peoples 996's in regard to this but I have seen these in your picture before and thought they were a good idea. Same with all of them. I have a couple of 3ft 8" x 3" planks i place on the 2nd 'rung'. Works perfect. OP - why don't you just buy a pair then mod to suit your plan? ......or with '911' starter slopes. I have a pair of those too, they are shaped like a banana now since I tried to drive the rear up the ramps. Those things are as cheap as chips Alex. I’d want something with a little more strength and width. Most of those are only for the lines of a 205 tyre. I think I’ll sketch something up here for a detachable style job and maybe see if I can get some time after work tomorrow to knock it up. I have something similar and have used them to death. The tyres are far wider than the ramps, but so what? I had a set of those and they are fine like Alex said, 250mm wide if I remember correct. You could alway weld a wider plate on top but really isn’t needed. They are a bargain to be honest but you will need a prank or similar to place a few rungs up. Right, so, had a little doodle there with sizes and ideas. Basically it’s going to have a 2 stage angle. First 1 based on the height and the length of the front bumper. This will be the starter ramp. I have allowed for the lowered car height so all should be good. After that’s slightly steeper angle to get it up to 300mm. Should be a decent height to work from. I’m planning on going maybe 300mm wise for stability. Also going to have a detachable set up so I can just remove the ramp part while the cars up. The detached part that the wheel will sit on will be about 300mm all round with a bit of support round the base. I saw those on YouTube earlier. Some excellent ideas but I just don’t have the space for them. I thought about getting some ramps (someone posted a link to a race ramp firm on here), but my greatest need is not to work underneath the car as such (except for oil changes), but to remove and swap the wheels, and access the brakes; in other words, I need a lift. As such I'm still thinking about the QuickJack. I have two trolley jacks, one under the front each side a bit at a time (helps if you have a helper) up higher than the ramps, onto axle stands. Then trolley jack to the back under the engine/gearbox join up a bit higher then remove ramps and onto stands.